Most wood stoves are either wood only or multi-fuel. Multi-fuel stoves have a riddling grate which allows ash to be riddled into a built-in ash-pan to create the conditions for optimum combustion. Wood only stoves have a fixed grate and no ash-pan because wood burns best on a bed of ash. Some stoves come as wood only as standard but can have an optional multi-fuel upgrade kit fitted. Fuels that can be used in a multi-fuel stove include smokeless briquettes not coal. Coal is too carcinogenic and produces a lot of tar and long term use can cause damage to the stove. Compressed wood briquettes can be used but make sure they are made from untreated wood. Your wood stove is only as good as the wood you’re burning. If you burn green or unseasoned logs, the stove won’t produce much heat, the glass will blacken and lots of tar will be produced clogging up your flue and increasing the risk of chimney fires. Trees contain a lot of water, and freshly cut logs will contain around 65-90% water depending on the species and are difficult to burn without some drying or seasoning taking place. Wood felled during one winter should be split and seasoned over the following summer and burnt the next winter when they should have around 33% moisture. If possible, two years seasoning is best to bring it to 25% moisture content. A reputable firewood merchant should only sell you seasoned logs, unless you specifically ask for fresh or green wood to season yourself. Logs are best stored outside but under cover where air but little rain can get to them. If possible bring your next weeks supply into the house and store somewhere warm like near but not next to the fire, stove or boiler. 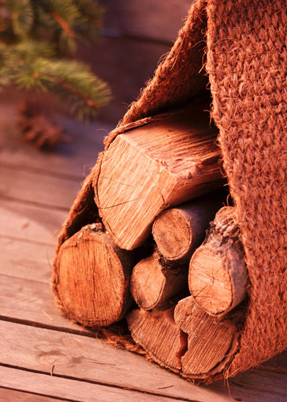 Alternatively, kiln dried logs can be purchased which have a moisture content of generally less than 25% and are ready to burn straight away. Kiln dried logs are more expensive than normal logs but give out a high calorific value than logs with a higher moisture content so they work out to be just as cost effective. Kiln dried logs are meant to be burnt in wood stoves and once you’ve tried them you’ll realise just how your wood stove is meant to perform! Consumers are increasingly turning to sustainable wood in the search for environmentally friendly renewable energy resources. During its life, a tree will have provided as much as twenty times more oxygen than is required for combustion and forests are able to absorb much of the Earth’s carbon dioxide imbalance helping to reduce global warming. Organised forestation can reduce our need to burn fossil fuels and decrease our need for nuclear power and supplementing your heating with an efficient stove or stoves is a significant step towards energy independence.